Peter Paul Rubens (1577–1640), Venus and Adonis (date not known), oil on canvas, 194 × 236 cm, Metropolitan Museum of Art, New York, NY. Wikimedia Commons. The final story in Book 10 of Ovid’s Metamorphoses is told by Venus, around her account of the transformation of Atalanta and Hippomenes, being her explanation to her lover Adonis as to why he should beware of lions and other savage beasts. Having warned her lover Adonis of the dangers of lions and savage beasts, Venus left in her chariot which was drawn by swans. Once she had gone, Adonis ignored her warning, and took his hounds out to hunt wild boar. They quickly found the scent of one, at which Adonis threw his spear. The spear struck the boar a glancing blow, and it was able to shake the weapon loose. As the young man was running away in fear, the injured boar charged at him, and gored him deeply in his groin. So the blood of her only too-mortal lover was transformed into the blood-red anemone flower. The passionate relationship between Venus and Adonis, and its tragic conclusion, is one of the greatest stories in art, both in terms of its frequency of depiction, and the quality of those paintings. During the height of narrative painting, from about 1550 to 1650, most of the Masters made at least one painting of this story. However, this account starts with a much later artist, and a work which wasn’t exhibited until the start of the twentieth century. John William Waterhouse (1849–1917), The Awakening of Adonis (1899-1900), oil on canvas, 95.9 × 188 cm, Private collection. Wikimedia Commons. John William Waterhouse’s The Awakening of Adonis was completed in 1899 but wasn’t shown to the public until the following year, when it was hung at the Royal Academy’s summer exhibition. Part of a series of his works telling stories of classical myths, it received great critical praise. 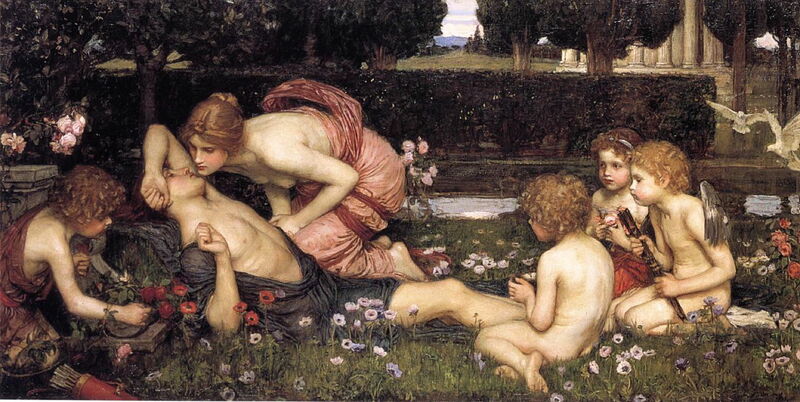 Although Waterhouse shows an early moment in Adonis’s affair with Venus, in which she is seen as the active partner, he hints at the outcome with a small group of red anemone flowers by his side. These contrast with the white anemones on much of the rest of the grass. Annibale Carracci (1560–1609), Venus and Adonis (c 1595), oil on canvas, 217 x 246 cm, Kunsthistorisches Museum, Vienna, Austria. Wikimedia Commons. Annibale Carracci’s Venus and Adonis from about 1595 – three centuries before Waterhouse’s painting – is a superb painting of Venus, her winged son Cupid, and Adonis. The latter has his bow in his left hand, and his hounds by his side, as if about to go hunting. 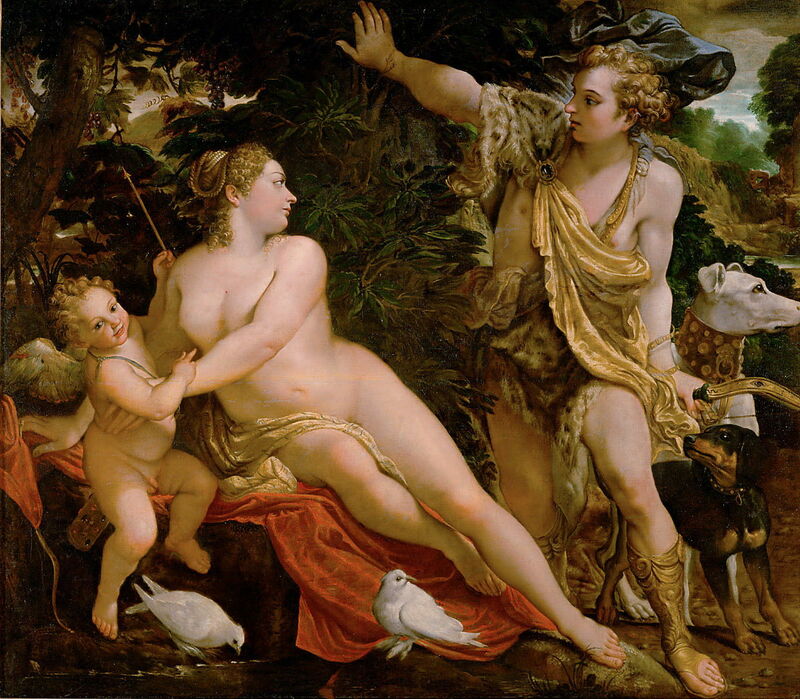 Carracci shows Cupid with an arrow in his left hand, and there is a small red wound between Venus’s breasts, implying that this is the moment that Venus was caused to fall in love with Adonis. Paolo Veronese (1528–1588), Venus and Adonis (c 1580), oil on canvas, 162 × 191 cm, Museo Nacional del Prado, Madrid, Spain. Wikimedia Commons. 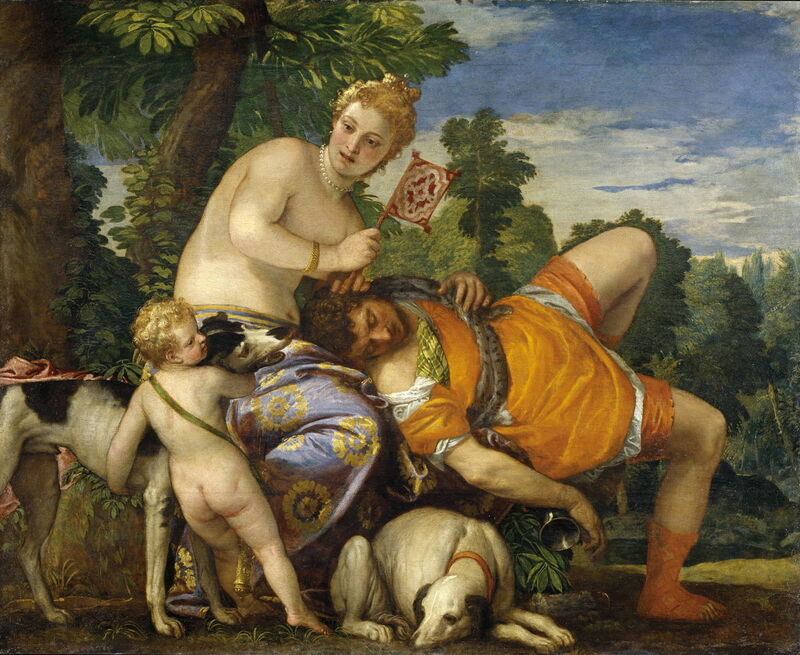 Paolo Veronese shows a later moment in the relationship between Venus and Adonis (c 1580), with Adonis asleep on his lover’s lap, and Cupid fondling the hounds. You can hear Cupid’s mother whispering forcefully to her son, telling him to restrain the dog from rushing forward, licking the face of Adonis, and waking him up. Veronese, and most later artists, dress Adonis in red, symbolising the blood that will be shed when he dies. Titian (1490–1576), Venus and Adonis (c 1555-60), oil on canvas, 160 x 196.5 cm, J. Paul Getty Museum, Los Angeles, CA. Wikimedia Commons. 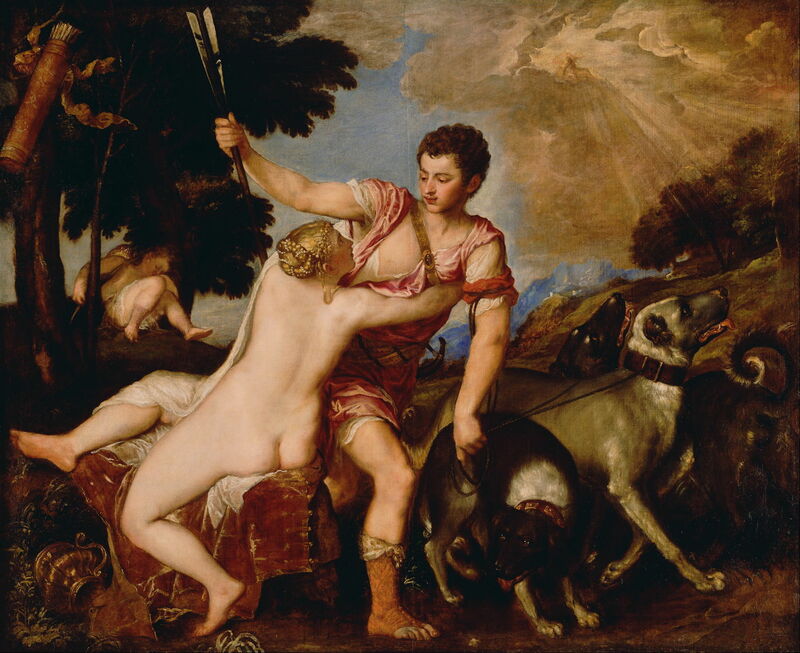 Titian takes us further into Ovid’s story, in his earlier painting Venus and Adonis, from about 1555-60. With the young Cupid asleep, cradled in a tree, Adonis wants to go hunting. He has his spear in his right hand, and his hounds on leashes held in his left. 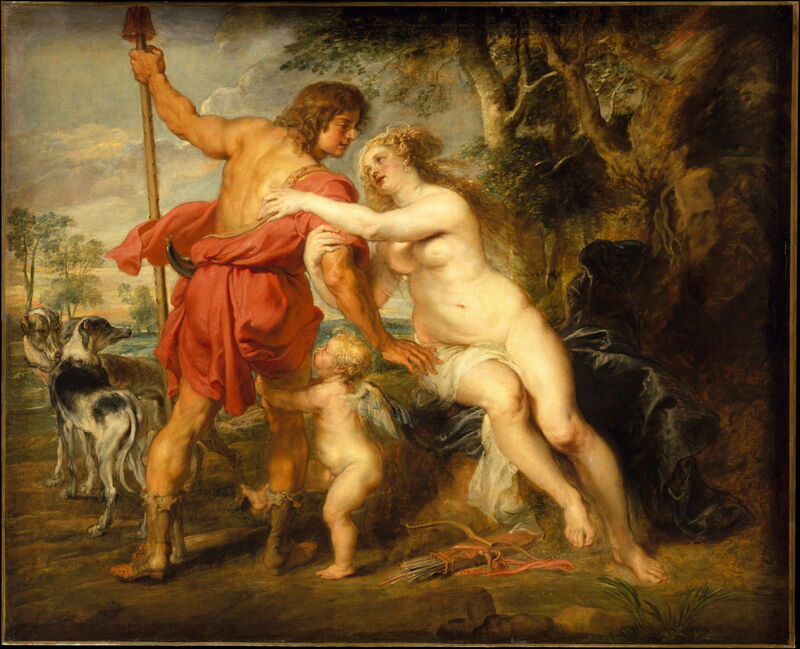 But Venus is terrified of what will happen, restraining him and telling the story of Atalanta and Hippomenes. Peter Paul Rubens skilfully reversed Titian’s composition in his Venus and Adonis from the early seventeenth century. Adonis is now trying to depart to the left, with his back to the viewer, which brings the beauty of Venus into full view, and strengthens the triangular composition. It also provides a natural place for Cupid, holding onto to Adonis’s leg to stop him from going to his death. Cupid’s quiver, left on the ground behind him, is a reminder of the origin of the relationship. The manner of Adonis’s fatal wounding is, of course, a piece of poetic justice: those who live by the sword, die by the sword, and the retribution for his adulterous relationship with the goddess Venus (the wife of Vulcan) is to be gored in the groin. This was clearly no scene for the visual explicitness of a painting! 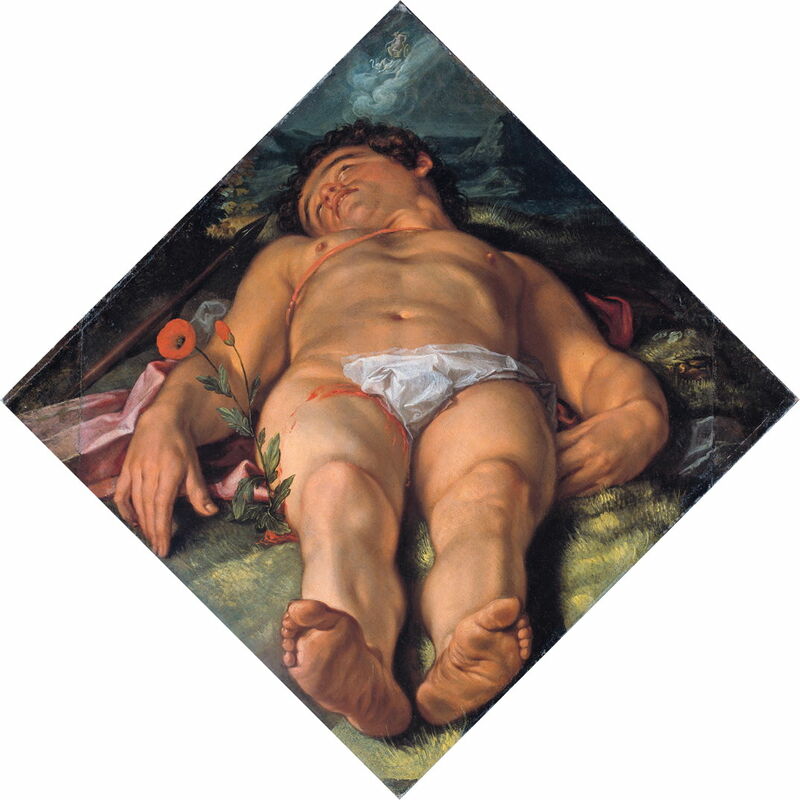 Hendrik Goltzius painted this breathtakingly foreshortened projection of the Dying Adonis (1609) on a square canvas stood on one corner, to frame the figure tightly. A token splash of blood on his thigh is matched by crimson anemone flowers, although Venus hasn’t yet arrived on the scene, and is at the apex, still in her chariot. Beside Adonis is his spear, although there is no sign of boar’s blood on its tip. Rubens, Sir Peter Paul (1577-1640), Venus Mourning Adonis (c 1614), oil on panel, 48.5 x 66.5 cm, Dulwich Picture Gallery, London. Wikimedia Commons. In or just before 1614, Rubens made this oil sketch of Venus Mourning Adonis, a more complex composition with the addition of three Graces, and the young Cupid at the right. Peter Paul Rubens (1577–1640), The Death of Adonis (with Venus, Cupid, and the Three Graces) (1614), oil on canvas, The Israel Museum מוזיאון ישראל, Jerusalem, Israel. Wikimedia Commons. 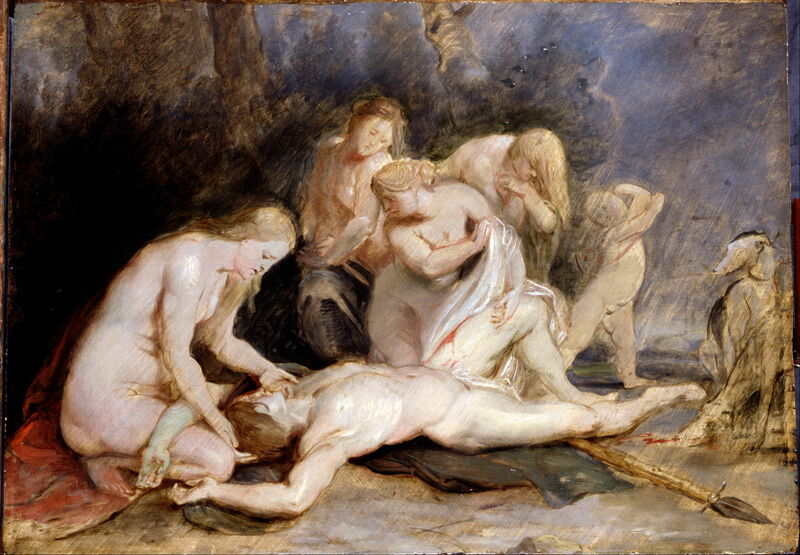 Rubens’ finished painting of The Death of Adonis was completed in 1614, and keeps the same composition. A rather portly Venus cradles her lover’s head (today you might even think that she knew about airway management! ), as the Graces weep in grief with her. Rubens has been more generous with the young man’s blood, which is splashed around his crotch, and spills out onto the ground, where the hounds are sniffing it. The fateful spear rests under Adonis’s legs. Cornelis Holsteyn (1618–1658), Venus and Cupid Lamenting the Dead Adonis (1647), oil on canvas, 99 × 207 cm, Frans Hals Museum, Haarlem, The Netherlands. Wikimedia Commons. 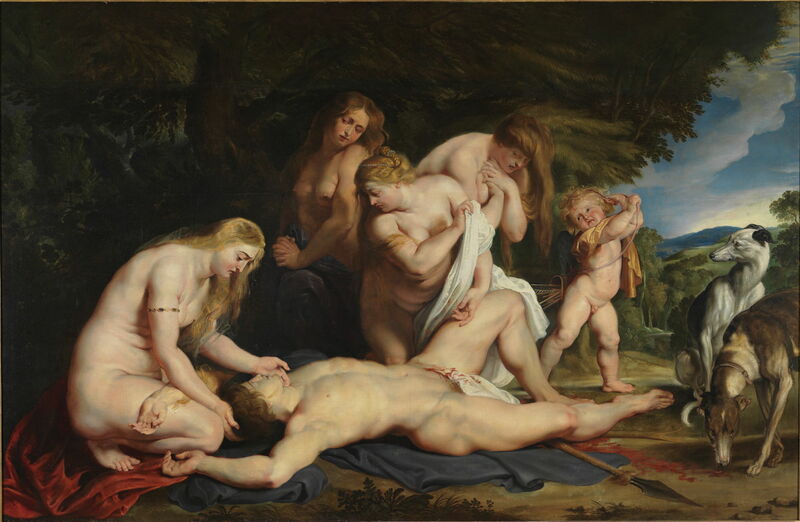 I particularly like Cornelis Holsteyn’s Venus and Cupid Lamenting the Dead Adonis from 1647. Although he is coy about showing much blood, his arrangement of Adonis’s body is novel, and his use of colour very apt. Venus sheds real tears as she is about to sweep her lover into her arms, and in the distance is the shadow of a wild boar with the hounds in chase. 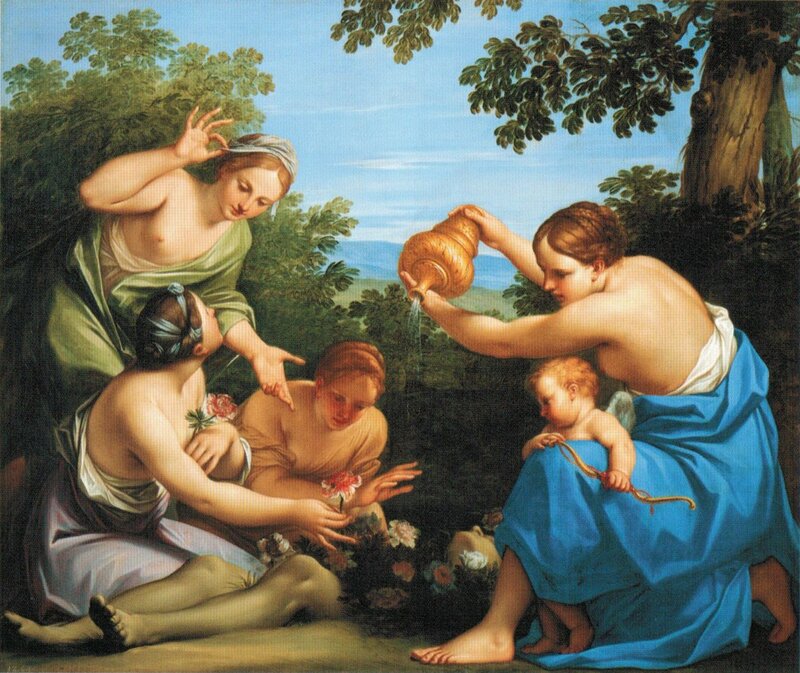 Marcantonio Franceschini (1648–1729), The Metamorphosis of the Dead Adonis (date not known), oil on canvas, dimensions not known, Palais Liechtenstein, Vienna, Austria. Wikimedia Commons. Marcantonio Franceschini is one of the few artists to show The Metamorphosis of the Dead Adonis, in this painting from about 1700. Venus is sprinkling a jar of nectar over the corpse of her lover, and anemones are already bursting into bloom. I hope that these wonderful paintings have brought Book 10 to a visually-rich conclusion. In the next article in this series, marking the start of Book 11, Ovid tells of another death, for which I will have more superb narrative paintings. And we are still only two-thirds of the way through the Metamorphoses. Posted in General, Language, Life, Painting and tagged Carracci, Franceschini, Goltzius, Holsteyn, Metamorphoses, myth, narrative, Ovid, painting, Rubens, Titian, Veronese, Waterhouse. Bookmark the permalink.